Trinitee Stokes-best known as Judy Cooper from Disney Channel's K.C. Undercover-is an actress, singer, inspirational speaker, and fashion designer who knows how hard it can be to be yourself while following your dreams. Since she began entertaining at the age of 3, Trinitee has faced her share of pressure and obstacles, handling each of them with courage and charm. In her first ever book, Bold and Blessed: How to Stay True to Yourself and Stand Out from the Crowd, Trinitee encourages other kids with big dreams. This book features Trinitee's answers to real fans about friends, faith, and fame, and also includes a special photo insert with pictures from Trinitee's childhood to now. Perfect for readers 8 and up, Bold and Blessed will empower girls and boys to chase what matters most and have fun along the way! 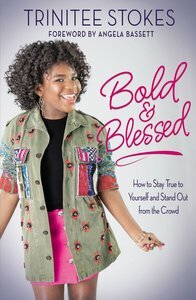 About "Bold and Blessed: How to Stay True to Yourself and Stand Out From the Crowd"
Vivacious, unique, and undeniably talented, Trinitee Stokes is a quadruple threat that has emerged in the entertainment industry. As an actress, singer, author, and fashion designer, Trinitee proves time and time again that she can do it all. She can currently be seen starring on The Disney Channel's hit series "K.C. Undercover."